Robert Shiller is best known for his correctly bearish forecasts on the housing market, which we are continually reminded of through the ubiquitous Case-Shiller housing index, and his aptly timed 2000 book entitled Irrational Exuberance. 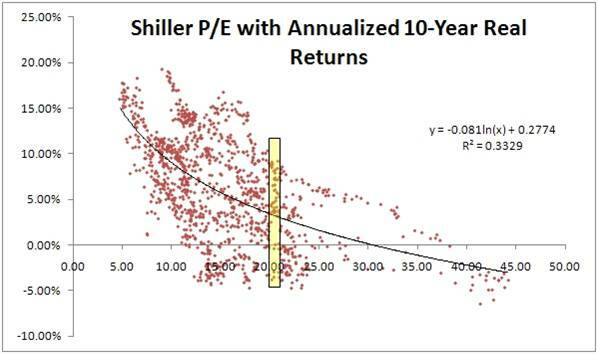 Shiller is also well known for his cyclically adjusted 10-year price-earnings tool, also known as P/E-10. This tool chooses to take a rearview mirror look at the 10-year rolling average of the S&P composite stock index to determine whether the equity market is currently a good or bad buy. Below average multiples are considered to be predictive of higher future returns, and higher than average multiples are considered to produce lower future returns (see scatterplot chart). If you were purchasing a home, would the price 10 years ago be a major factor in your purchase decision? Probably not. Call me crazy, but I would be more interested in today’s price and even more interested in the price of the home 10 years into the future. The financial markets factor in forward looking data (not backward looking data). 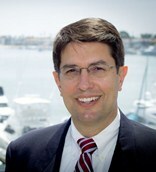 Conventional valuation techniques applied to various assets, take for example a bond, involve the discounting of future cash flow values back to the present – in order to determine the relative attractiveness of today’s asset price. The previous 10-years of data are irrelevant in this calculation. Although I believe current and future expectations are much more important than stale historical data, I can appreciate the insights that can be drawn by comparing current information with historical averages. In other words, if I was purchasing a house, I would be interested in comparing today’s price to the historical 10-year average price. Currently, the P/E-10 ratio stands at a level around 22x – 38% more expensive than the 16x average value for the previous decade. That same 22x current P/E-10 ratio compares to a current forward P/E ratio of 13x. A big problem is the 22x P/E-10 is not adequately taking into account the dramatic growth in earnings that is taking place (estimated 2010 operating earnings are expected to register in at a whopping +45% growth). 1) The future 10 years might not be representative of the extreme technology and credit bubble we experienced over the last 10 years. Perhaps excluding the outlier years of 2000 and 2009 would make the ratio more relevant. 2) The current P/E-10 ratio is being anchored down by extreme prices from a narrow sector of technology a decade ago. Value stocks significantly outperformed technology over the last 10 years, much like small cap stocks outperformed in the 1970s when the Nifty Fifty stocks dominated the index and then unraveled. 3) Earnings are rising faster than prices are increasing, so investors waiting for the P/E-10 to come down could be missing out on the opportunity cost of price appreciation. The distorted P/E ratios earlier in the decade virtually guarantee the P/E-10 to drop, absent a current market melt-up, because P/E ratios were so high back then. 4) The tool has been a horrible predictor over very long periods of time. For example, had you followed the tool, the red light would have caused you to miss the massive appreciation in the 1990s, and the green light in the early 1970s would have led to little to no appreciation for close to 10 years. How good an indicator was P/E-10 for the proponent himself at the bottom of the market in February 2009? Shiller said he would get back in the market after another 30% drop in the ratio (click here for video). As we know, shortly thereafter, the market went on a near +70% upwards rampage. 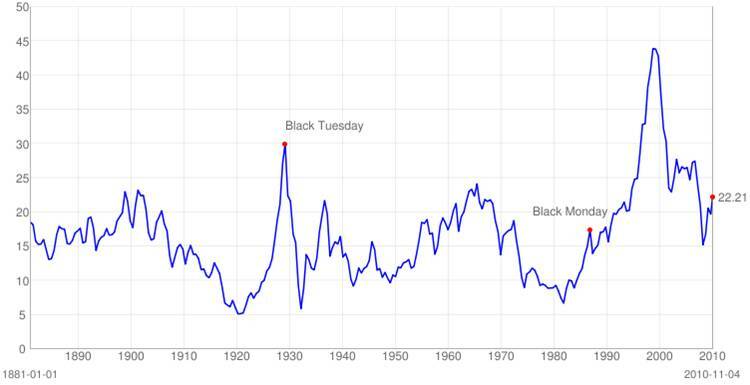 I guess Shiller just needs another -55% drop in the ratio from here to invest in the market? Incidentally, Shiller did not invent the cyclically adjusted P/E tool, as famed value investor Benjamin Graham also used a similar tool. The average investor loves simplicity, but what P/E-10 offers with ease-of-use, it lacks in usefulness. 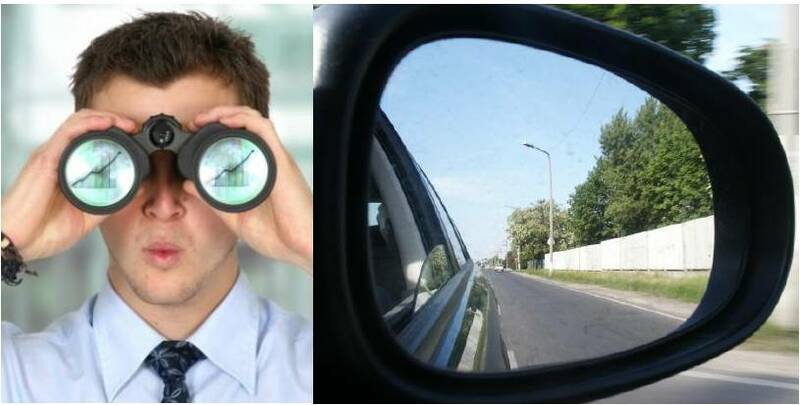 I agree with the P/E-10 intent of smoothing out volatile cycle data (artificially inflated in booms and falsely depressed in recessions), but I recommend investors pull out a pair of binoculars (current and forward P/Es) rather than rely on a foggy rearview mirror. Entry filed under: Education, Financial Markets. Tags: Bob Shiller, Case Shiller, PE ratio, Robert Shiller, valuation. Flying to the Moon via Hyperinflation	Will the Fiscal Donkey Fly? Good one…I think I’ll steal that one and add it to my repertoire!